Toe walking. It’s one of the most difficult and common child development issues I run across in my pediatric therapy practice. I have to admit, every time a preschool teacher comes to me and says, “I think you need to take a look at this student, he is really up there on his toes”, I cringe a little bit. And here’s why– toe walking can range from a totally normal developmental phase to a BIG problem. Here are some thoughts on this very common developmental issue. Toe walking simply means that a child walks on his tip toes or doesn’t contact the ground with his heel first when taking a step. This is considered “normal” until sometime between the ages of 2 and 3. Beyond that age, without any definitive medical reason, it is considered idiopathic toe walking, or toe walking without a known cause – simply a habit the child has developed. The definition of toe walking is simple, but what’s not so simple about habitual toe walking is WHY? There are many possible reasons that children might develop a toe walking pattern and the research does not definitively point to one specific cause. Are they exhibiting tactile defensiveness in their feet? Is there a proprioceptive or vestibular problem? Or could toe walking be a warning sign of a neurological disorder like cerebral palsy or muscular dystrophy? Could it be a sign of autism? Is the child’s calf musculature so tight that he can’t put his heel down? Is this simply a habit that could eventually lead to tight calf musculature and the inability to put the heel down? But not every child who walks on his toes has a serious diagnosis coming down the pike. I have seen several kiddos that simply outgrow the toe walking pattern. Some research indicates that children will usually outgrow it by the age of 5. Most often, if a child is showing no signs of developmental delay other than toe walking, he will outgrow this pattern and continue with typical development. As therapists, we are more concerned when toe walking is accompanied by additional sensory processing concerns or other developmental issues. 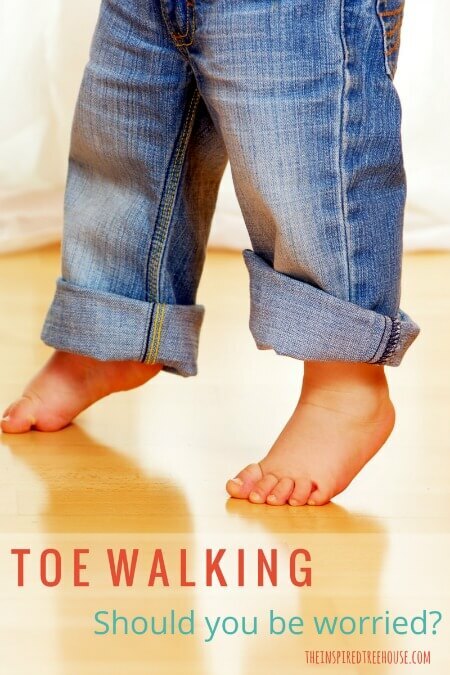 Many parents wonder how to stop toe walking in their children. Therapeutic treatment for toe walking depends on what the cause is, how strong of a habit it is (do they ever contact the ground with their heels, or are they on their toes all the time? ), how tight the gastrocnemius muscles (calf muscles) have become, and what other changes have occurred in the child’s foot and ankle muscles as a result of walking this way. Treatment methods can include stretching, serial casting (a series of casts applied over time that gradually stretch the heel cords), or botox injections (used to temporarily paralyze the calf muscle so that it is easier to stretch). Bracing can also be used to limit movement, preventing the child from getting up onto his toes (in milder cases, stiff boots or high top tennis shoes can sometimes have the same effect). In rare and severe cases, surgical lengthening is also an option for treatment. If the toe walking is caused by a sensory issue related to the child’s inability to tolerate the feeling of the ground on his feet, sensory interventions can be introduced and may include the Wilbarger brushing protocol, proprioceptive input via vibration or deep pressure to the feet or shoulders. Ultimately, the reasons behind toe walking are often difficult to determine. Even after 15 years of experience in pediatrics, I find this to be one of the most difficult issues of child development to get to the bottom of and to treat. There are many conflicting views about which treatments work and which ones don’t. My opinion is that every child is different and will respond differently to any given treatment. What works for one may not work at all for another. 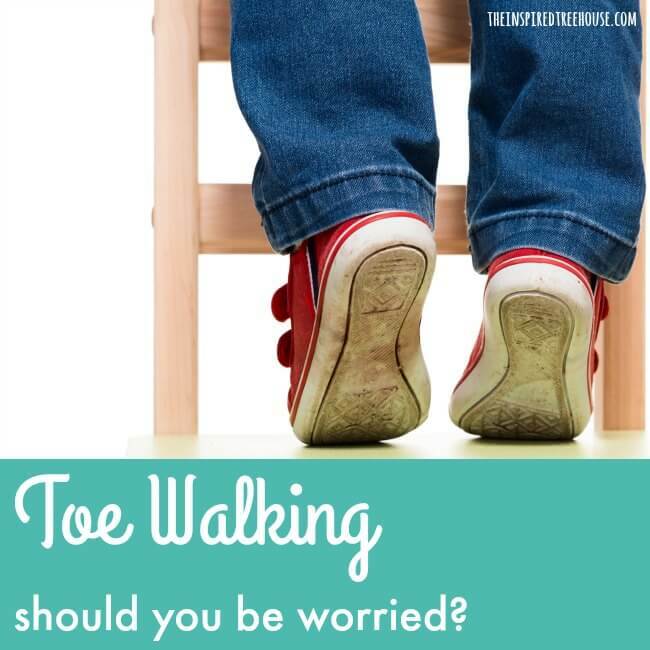 Either way, toe walking is definitely something to be aware of and to monitor. If your child is over the age of two and walking on his toes regularly, it wouldn’t hurt to consult your pediatrician. You may simply be told that he or she will outgrow it and that may be true…or maybe not. Are there other sensory processing or developmental concerns? Are you noticing other motor concerns? Are your child’s heel cords getting so tight that he can’t even stand on flat feet if he tries? If you’re concerned, be sure to speak up at your next appointment with your pediatrician. Be an advocate for your child – you know him better than anyone! Get things taken care of before something small turns into something that will take more serious measures to correct. Check out our best therapy tools and child development resources here! Lol…. My brother & I used to do this all the time, (unknowingly) and still do from time to time, my husband catches me. I am 33 yrs old, my brother 31 & we are fine, neither one of use have a neurotgical disorder nor a muscular dystrophy. I’m not sure why we do it, except maybe it’s just out of habit or maybe it just felt good to stretch out our legs? I’m not certain only because I do not realize I’m doing it in the 1st place, much like if someone were to bite their purse eir lips or swing their legs while writing! Hi Dani….thank you for your comment. I know many adults who still toe walk from time to time — they were all great sprinters in track! :) If it hasn’t caused any other issues for you, that’s a good thing! I am 18 and I used to walk on my toes as a kid but it stopped and one day my heels just couldnt touch the ground. I’ve been walking on my toes for the past two years .. its actually come to a stage where my heels don’t touch the ground at all. I’m on y toes all the time because I can’t put my feet flat on the group. Please help!! You should try to go to Liesa Persaud’s toe walking course. amazing! Thanks Erikka….I’ll look for it! Yes. You need to attend Leisa Persaud’s course. She believes in early assessment n intervention …not waiting till age 2 or 3 until ” they grow out of it”. By then foot anatomy n structure ca n be irrevocably changed. She also has developed an assessment tool which is fantastic. I am 29 and still walk on my toes often. It drives my husband nuts when I do, but I don’t even notice. I can’t walk flat foot on certain surfaces (mostly on un-carpeted areas) with out shoes. Hi Steph! Thank you for taking the time to comment about your personal experiences with toe-walking! My daughter has always walked on her toes and when she was younger she would walk on her bent under toes(like toe knuckles…lol) it looked painful but never bothered her everyone made the “she’s going to grow up and be a ballerina!” comment. She’s 6 and has been diagnosed as having High Functioning Autism disorder. They said the toe walking wasn’t part of diagnosis but more due to the sensitivity issues that go with it. Hi Kristen…thank you for taking the time to comment! I cringe every time I see kiddos walking on their bent toes….although, I really wish my feet were that flexible sometimes!! 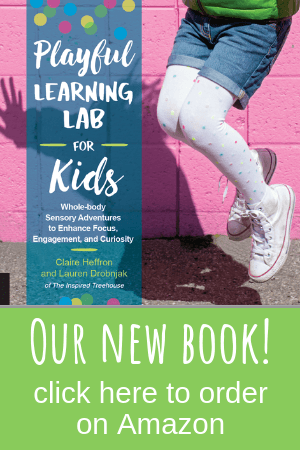 Yes, toe-walking can definitely be an indicator of sensory involvement. That is part of why it is so difficult to treat! Thank you for your comments; I’m 45 and still toe walk and nothing Is wrong with me……wish I could be a dancer. god bless everyone. My 6year old son walks on his toes and always on the top of his foot. I just don’t understand how he is not in pain when he does that. I always catch him and tell to walk on flat foot….flat foot baby. But turn and look again and he is either on his toes or toes under his foot…. I even have picture with him like this and it does not even seem to hurt or he does not realize this is what he is doing. I have never seen another child doing this and for you to mention this just caught my attention. Did your son stop doing this? Were you able to find the cause? I’m nearly 40 and I have always walked on my toes! When I was younger, if I stood flat-footed I seemed to list forward and would lose my balance. That isn’t so much the case now, but I have walked that way for so long it is habit. I try to be aware and walk flat-footed, but most of the time I’m up on my toes. I cannot wear really flat shoes, but other then that I don’t seem to have any real issues. 20+ years of horse-riding probably helped prevent my calf muscles from being really short! Hi, I have a three year old son that walks on his toe in the last year we found out that he has CP ,He is now moving on to working with IU . We are waiting on his braces and I’m looking into play therapy..because the iu only test for will this effect his schooling .I feel it will because I feel he needs one on one when at a play ground. I noticed something wrong with his feet when he was a baby and when he was starting to stand he used the inside of his feet. All three of our oldest kids do this, and I wouldn’t be concerned except for the fact that there are other sensory issues we’re noticing – chewing, mouthing, crashing into objects. I’m just beginning our SPD diagnosis journey, so it’s good to know that this is something else to mention to our pediatrician (when we find one we like). Thanks! I read your article about toe walking. 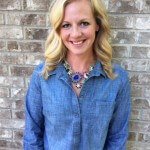 I am a child developmental specialist and have been working with children birth to 6 for more than 30 years. In most of the cases where the children had no diagnosed medical condition the toe walking usually came from the young child being in a walker for more than 20 minutes at a time and limited to only a few times per day recommended. One child I was working with was 10 months old and was showing all signs that she was ready to walk. Then the mom decided the child needed a walker. After one week of being confined to the walker for long periods at a time the child developed toe walking and she was 14 months of age before she walked. My son walks on his toes and he’s 6, no signs of any other issues, he is advanced in school and does not have any behavioral issues. We NEVER used a walker because my sister-in-law who is a PT told us not to. He will walk heal toe when reminded and it does seem to be getting a little better but his calf muscles are tight which also causes his muscles to be tight all the way up his back. Shiners has been a blessing for me my 7 yr old walks on her toes all the time every time she has a growth spurt we do cast for 4 weeks then back in braces. I don’t want herr to grow up and walk on her toes all her life. The muscles draw up causing bad balance. Have you had your child evaluated. I agree! I feel that a huge piece of toe walking relates to the child’ postural alignment. Once the center of gravity moves forward (for example in a low tone lordotic trunk scenario) the body’s natural balance response sends you up on your toes. Being in a standing device like a walker also promotes this posture of flexed hips and forward pitched trunk with the weight on the toes. So many things to look at from the start related to posture, balance, and movement in addition to any possible ankle tightness or tone issues and the possible impact of the sensory system. Don’t wait for this issue to go away on its own. Walking is a complex motor pathway and once learned it is very difficult to change, especially after a few years. That’s when Botox, serial casting, bracing, etc are often more necessary. My son was a toe walker, and one thing that was a red flag to the doctors & PTs we saw was that one of his feet was much more affected than the other. My understanding is that this made it much more likely that the toe walking & tightness was caused by something neurological rather than the muscle tightening from habit. I am an OT also. In addition to understanding sensory causes of toe walking, I have also been studying the affect of retained primitive reflexes on development, especially with toe walking. I recommend that therapists should explore the work of Sally Goddard and Svetlana Masgutova. Hi Aishah….thank you so much for sharing that information. We will definitely check it out! I have always walked on my toes it seems to irritate everyone except me, I was starting to get worried that there was something wrong with me. I have never had any cognitive issues or developmental delays. I am glad there are others who have turned out fine. Also my parents never bothered talking to doctors about it so this is pretty helpful. I am also hearing impaired. One method my great aunt in Florida did to help me overcome toe walking and being pigeon toed in my youth was have me do foot exercises flexing my feet and lots of running barefoot on the beach. Lots till I was exhausted but it strengthened my arches and greatly improved my gait. Just wanted to share so while my left still toes in slightly certainly can’t complain with the overall results. My firstborn daughter, soon to be 52 years old in May, was a toe-walker. We took her to many doctors about this condition. It went from “IG” (ignore) treatment to the exercises to strengthen her arches. Then at age 21, her bunions were too pronounced with lots of pain on her “duck feet,” she had surgery on both feet. Today she has difficulty buying shoes that are wide enough. Cannot walk on sports or athletic shoes. However, she can navigate on very high heels. As I recall 50 years ago one doctor said it was good she was a female, she could always wear high heels. I have been reading various websites about this. She does have neurological problems (bi-polar dual diagnosis with ADHD), so maybe there is some connection–? We have learned so much about the body in the last ten years, it is amazing! I have a 28 year old friend who my mother calls ‘twinkle toes’ because he appears to glide through a room on his toes, with his heel almost touching the floor… He sees nothing wrong with his walk but has once or twice said that his calf and hamstring muscles are short (I hadn’t considered the relation to the toe walking). He also has wide feet and really battles to find shoes and have them withstand the stretch as well as the wear and tear that they get under the balls of his feet. I mostly found your comment interesting because he also suffers from severe ADHD and mood disorders, and your post is the first to really suggest anything similar in nature (other than the mentions of other neuro dispositions). My 8 years old son is toe walking from left leg.her left hand is also somewhat weak n also some smaller than right side. I concerned many doctors n they said there is no treatment except excercise.now what hould i have to do.plz. suggest me. Hi Sony….I am sorry that you aren’t getting a good response from your doctors. Unfortunately, I can’t offer you much advice since I can’t see your son in person. Please keep trying to find a doctor that can help. You are your son’s best advocate. My 3 yr old son began toe walking at about 2 1/2 yrs old. He was red-flagged for autism before the age of 2 and diagnosed by his pediatrician before his 3rd birthday.. He also has SPD (mainly sensory seeking) and I will be talking to his pediatrician regarding his possible Selective Eating Disorder and Immune Deficiency Disorder. He does not toe walk often but prefers to walk barefoot while at home. One of his ABA therapists first noticed his toe walking during one of his sessions almost a year ago. He did it so sporadically (still does) that I had not even noticed it. Successful treatment of toe walking includes a comprehensive physical therapy program focused on stretching and strengthening of ankle and foot musculature as well as core musculature which is a primary component. Often I find that the abdominal muscles are so weak in children that I treat with toe walking that they cannot accept any balance challenges from the front without falling straight backwards. I do not consider primary toe walking normal at any age, and if a child is doing so more than half the time, I think an immediate referral to therapy is indicated. Once that motor pattern is ingrained it becomes more and more difficult to change it. I would also point out that the new research on Botox indicates that it should not be used. my 7 year old daughter has SPD and is a toe walker. It turns out vision can also play a big role in toe walking. While she has 20/20 acuity she has other neuro visual processing problems and prism glasses have helped correct her toe walking. Absolutely! Like scoliosis, idiopathic toe walking has a (visual) perceptual basis and effects many. Some of you may want to read Dr Melvin Kaplan’s work (Seeing through New Eyes or The Secrets in their Eyes). He pioneered this research and the way prisms are used for treatment in toe walking. I am looking into prism glasses for my 7 year old son who is toe walking. We have seen the gp and other specialists and the answer is always “he will grow out of it”. Would you be able to tell us where and how you got the prism glasses for your daughter. Any info would be much appreciated. I have ordered the book suggested by Barbara. I am a 30 year old female who has toe-walked since as long as I can remember. For me I think it is more of a structural issue because even though I am fit and healthy in most other ways but I have never ever been able to touch my toes or grab the ends of my feet while sitting with my legs extended. It causes sharp pain from my planters area of my foot all the way up my calf muscles. Even a day of running around playing lawn games in my bare feet causes my muscles to be tight and painful for a day or two. Most on-line discussion seems to be centered around various congenital conditions or autism. Does anyone know of any physiology based research. I am a PT and it sounds to me like you may have flat feet or pes planus. Have you been evaluated for this to see if having some form of shoe insert or orthotic would benefit you? I have treated people with these kind of symptoms who do very well once their feet are properly aligned. I would see a PT who focuses on foot conditions! I was/am a toe walker… My parents got me into horseback riding which encouraged me to stretch my legs and get them down. This helped. I was told that I toe walked because I was born with short Achilles’ tendons… I’ve always got tight calf muscles, but I don’t really toe walk much now. I do toe RUN. I have a terrible time running with my full foot due to pain. The more I stretch for a sport, the better it is but it’s still present. The Botox injections sound interesting… I’m wondering if the tight calf muscles could be a contributing factor in my lower back pain. I was told that I toe walked because I was born with short Achilles’ tendons… I always have tight calf muscles, but I don’t really toe walk much anymore. I do toe RUN. I have a terrible time running with my full foot due to pain. The more I stretch for a sport, the better it is but it’s still present. The Botox injections sound interesting… I’m wondering if the tight calf muscles could be a contributing factor in my lower back pain. I had a girlfriend who’s child had this issue. She wound up needing surgery, because the musculature had tightened up so far. Fast forward 20 years, and our new Youth Pastor’s daughter Belle did this all the time. Belle was 3-1/2 at the time. One day, I asked her, “Belle, can you walk flat-footed?” She replied that she could, so I asked her to show Me. She walked 15 feet across the room, turned around & walked back. Puzzled, I asked her why she walked on her tiptoes. She cocked her head to one side, put her hand on her hip and said, “Duh! It’s what I do!” I was laughing so hard, I almost fell out of my chair! My question is this, do I tell my mom to leave it alone? Is she making it worse? My daughter is strong willed and I am afraid that my mom is just making her mad enough to keep doing it. I just came across this article. I babysit a 10 year old boy who, without shoes, walks on his toes. I always thought it was odd and I know he is being “treated” for ADHD and anger issues…wonder if there is a correlation. My 9 month old is a toe walker. Well she hasn’t started walking on her own but, when she tries she is up on her toes wth them bent underneath. She hates wearing shoes as well. She seems to be normal in everything else. Should I be concerned at this age? My 2 1/2 year old walks on her toes. They have told us she is a habitual toe walker. She is not showing any other signs of disorder. We have seen orthopaedic surgeon physio and orthotist. They recommended boots and have given us metal.plates to.put in them. We are to go back to the surgeon in August and he said if theres no improvement they will.put her in casts. I walked on my toes when I was 5 and was diagnosed with Perths disease..spend 20 months with both legs in a cast connected at an angle to minimize movement of hip joint. Was very mobile..kids addapt to everything. …I would suggest taking kids to orthopedic specialist if toe walking persist. I was told you can have permanent disability of the hip joint if not treated.. Any new info on this disease.? Sad to see that chiropractic is not even mentioned as a valid treatment option. Chiropractic adjustments are the best treatment to allow the nervous system to function optimally. If a muscle Is short and tight, it is being told that by an abnormal functioning nerve. Nerves can have abnormal signals coming from them from abnormal spinal joint positions. These abnormal positions can be caused by birth stress, excessive leg lifting when diapering a child, falls as the child is learning to walk, and numerous other events. The treatments are also completely non invasive, does not require a lot of treatment time, and makes kids feel so good all while taking care of the problem. My daughter has been under regular chiropractic care since she was 3 days old. She has just turned 3 and is a toe walker. I’m a huge proponent of chiropractic care. Sadly, it doesn’t cure all. My daughter walked on her toes until she was 5; doctors referred her to Shriner’s Hospital and they performed surgery on her calves and feet. She was in full leg casts for awhile, then short casts, then leg braces. The process was totally successful and now, as an adult, she has no difficulties other than 2 small scars on her calves and two on the bottoms of her feet. Interestingly, it seems the toe walking started when she was very little and was enamored with ballet. She eventually got to a point where she could not flatten her feet on the ground. I thought toe walking was just cute, until my daughter’s 4yr health check. 12 months later and after serial casting, Botox and now AFOs, MRIs and tonnes of appointments, she has CP – diplegia. I wish we’d seen an article like this earlier and the treatment could have started years ago. My sister did this toe walking and it turned out her hip was out of the socket. Crawling had not been an issue but when she began walking she walked on her toes. X-ray helped diagnose it. So yes, it can be nothing, something to certainly keep an eye on. My daughter was born at 27 weeks, she has ALWAYS walked on tip toes. I have had gut feelings it was related to being premature but her father also has physical inability to dorsiflex his feet past 90 degree. After numerous paediatric follow-up appointments and temporary success with casting treatments with specialists ruling out neurological causes, I still believe her 95% tip-tie walking is sensory based. We have seen paediatric orthopods who assure me Miss L will slowly improve and to not worry about future physical compromised but I just can’t help but think there is more premature contributions than paediatrists seem to advise. A mother knows their child better than anyone and I know it’s not just hereditory!!!! Wait, do you mean only walking on the toes out anytime someone walks by touching their toes to the ground before their heel? I learned to walk toe-heel instead of heel-toe because it makes less noise, which is a good thing when you live in an apartment. This is great information! I just wanted to say that it’s not always a sign of something more serious when a kid walks on their toes. I am in my twenties and have walked like that from 11 months. I have the ability to dorsiflex past 90 degrees and can walk “normal” if I think about putting heel down before each step. I played competitive sports through college without issue. The only problem I have is finding shoes that are wide enough for my big feet! My 10 year old daughter began tow walking at the age of three and numerous pediatricians brushed it off and said it was ideopathic and would correct itself. We remind her regularly to walk heel-toe and she can walk normally if she’s consciously making an effort to. 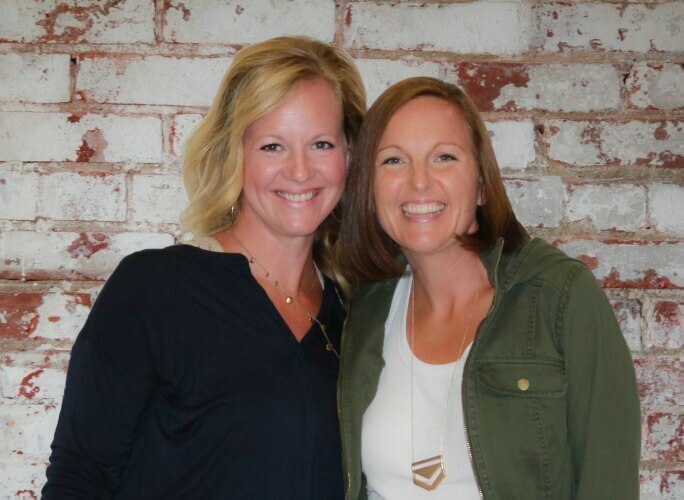 A few years ago we noticed that she had developed bunions and brought it up again with the pediatrician who referred us to a orthopedic specialist who recommended stretching out the achilles tendons and possibly bracing the feet at night. Now a neurologist is saying that this could be a tethered cord or hydrocephalus and ordering MRIs. One the one hand, I’m glad to have someone taking this seriously after years of ignoring it, but on the other hand these possible diagnoses are sounding pretty terrifying for a child who is otherwise perfectly healthy. Have you heard of this? Is this common or should we seek a second opinion? my son started walking on his toes at age 2, and is now almost 9. We did serial casting at age 6 for 6 weeks, and then physical therapy. It worked for awhile but then he was back on his toes. He has had 3 MRI’s – they found a Chiari malformation at the first one but it is not serious and nothing that would indicate a reason for the toe walking. The orthopedist says it will get worse over time. He could not stand straight up with his feet at a normal 90 degree angle. He would bend forward. Just last week he finished his 2nd round of serial casting and is now in leg braces that he wears for 6 hours a day, as well as a few yoga-type stretches before bed and in the morning. No other indications of problems, but still trying to get his legs sorted out. MY Son has he same. I tried taping, small little balls under the toes, stretching etc. we are now trying a small brace around the toes that stops it a little bit, but gives him reminders. it seems to work well for him. I always wondered if today I would have been diagnosed with some mild form of add as a tot. Today I only toe walk when the floor is super cold and well, that’s a given! I didn’t know flat feet could also be a cause of this. It explains part of why I got into it in the first place, too. my little brother is ten and still is walking on his toes???? My 4 Year Old Son Toe Walks. Has done since he first walked at 13 months. He has been diagnosed with ASD & SPD. He does stretches everyday & wears NIMCO Boots prescribed by ORTHOTICS, His calf muscles aren’t tight & He can walk Flat Footed. At First I was told it was because of the AUTISM, Then it was SENSORY, Now I am being told It is IDIOPATHIC. This can also be a symptom of joint hypermobility (which can have a lot of other sensory issue correlations.) A child with loose joints can feel very unstable, fear falling or not quite know where they are in space, since loose joints don’t always provide much proprioceptive feedback. They may then use tightening of the adjacent muscles (e.g. by lifting the heels, or if the knees are loose, tightening the quads or locking the knee joint by pressing it backwards) to stabilise themselves. They don’t necessarily know they are doing it, as this way of supporting themselves feels like “normal” to them. So toe walking can be a useful, protective adaptation to having loose joints, but also possible for it to cause some negative effects over the long term. Therefore it is useful to look at joint hypermobility as an another possible cause, so that you can rule it out or proceed accordingly. There is plenty of information online. My neighbours’ child is 7 yrs old boy. He is normal child don’t have any mental disorder but by one of his leg he always do toe walk, we ask him to walk properly but he said he feel pain. They consult with many doctors but every one said every thing is normal, so pls suggest what we do. My 5.5 year old daughter toe walks and says it hurts to stand flat footed. I took her to her pediatrician but he says she will outgrow it because his son outgrew it when he was 8. It could be nothing but I still don’t like it. She overall does well in kindergarten but she does not have great hand coordination. She can write and hold a pencil but her handwriting is terrible. I wonder if the coordination is somehow related. Can anyone tell me the problems of idiopathic toe walking is left untreated? I’m 14 I’ve done this for a long time. I don’t know when it started. When I was younger a little kid I had to go to a therpary thing that was suppose to help with it but I refused and told them I wanted to keep walking on my toes(I was young). I am a good runner though! And I’ve never had any problems with it. I never notice when I do it until people tell me. No kidding, nothing like stating the obvious. Everyone with half a brain KNOWS EACH PERSON IS DIFFERENT it doesn’t matter what you are talking about! And you charge how much per office visit? I’m 15 years old and I’ve been walking on my toes since I started walking. I mostly walk on my toes when I’m not wearing shoes or I’m raise myself higher without shoes. I’m not going to self-diagnose myself but should I ask my parents to get this checked out? I want to information that…. my cousin she is of nearly 10 years old ,but she cant able to walk .From the time of the birth she cant able to walk,her legs are so weak that she cant able to walk with support also. And she just crawl on the land just like a few months baby.We have consider all the doctor in our place but their is possibility about her problem in her.She cant able to walk like us. I have 21 months old daughter who does toe walking in left leg alone since she started walking. Before walking, she used to cruise with both legs on Toes. Now, she is able to walk with right leg with heel to toe and left leg remains in toe. Her Dr. said that there is slight tightness in the calf muscle and with physiotherapist help she could walk normal, but after 1.5 month of theraphy, she could stand both leg in normal position, if we asked to do. Walking is still on toes in left leg, so we are planning to put splint (AFO) to her. Is it advisable to put splint or she walks normally on her own? Have you considered looking into retained reflexes? My daughter turned 4years old and she does this everyday all the time I’m starting worry we have to tell her to walk with her feet to the ground she does but goes back to walking on her tiptoes! She’s hasn’t got anything else wrong no sensory problem no development problems nothing wrong with her motor she’s fine healthy and cleaver I used to do the same once in a while I still do time to time but I just wish she’d walk flat feeted do you think she will outgrow it and think I should see the doctor and see what they say?? I was actually a toe walker as well and didn’t stop until I got to 6th or 7th grade. What I mostly remember from my experience was the slight pain I would get when I tried to put my feet completely flat down. Man was that a bad idea. My parents however were eventually able to take me to my doctor where she put me in casts on both my feet as a type of therapy. I stayed in those casts all summer and once I got them off I would occasionally walk on my toes but I grew out of it. Before the casts however it was painful to walk normally since I was constantly trying to force myself to be normal as a little kid. I don’t do it anymore but when my mom sees me walking when I’m toe walking around a puddle she freaks out thinking I’m going back into that habit. So make sure to take care of the problem early on and go to your doctor! Thankyou for this i have been reserchi g this. I am 11 and i never put my heel on the floor as it brings doscomfort and pain. I have been told by a teacher i have short akilies in my legs and now i am going to seek medical advice. My husband and son toe walk. For my son, ice skating helped a lot. He plays hockey which is in a stiff boot and cannot skate on his toes. Truly helped him break this habit. He has sensory issues and auditory processing, but developing normally and is a fine athlete. Hockey is a suggestion for athletic toe walkers. I haven’t read through all of the comments, but I didn’t see a reference to the Tonic labyrinthine reflex, which is a significant reason for toe-walking, and one that I find to be more prevalent than musculature or sensory. It would be nice if you get a chance to update this post since many parents need to be informed about integrating reflexes, especially when there can be a relatively simple fix to this problem. an occupational therapist who is experienced in reflex integration can often resolve this issue successfully. I was a toe walker as a kid. Surgery casts and braces from ages 4-6. 40 years later officially diagnosed with CMT. Hopefully it continues to be a mild case. Such a bummer. It’s interesting that two walking can cause ankle problems in the future. One of my little cousins walks on his toes and his mother has been worried about him. I’ll share this article with her, so she can make an informed choice about whether or not she wants to take him to a podiatrist. I realize my toddler son does this. We have hardwood floors and he hardly wears shoes or socks. We also have pets (2 spoiled Pomeranians) my dogs tend to leave trails of dog kibble on the floor or carpet. And my son now recently starting to express more. He stands on his tippy toes and says DIRTY. Pointing to the floor. I ask him honey do you need me to clean. And he nods his head. Mind you I’m a clean freak but sometimes as a mother it’s very hard to keep the house tidy. This may be the real cause of why we use our tippy toes from young age. They are habits to avoid discomfort. Mind you when I’m done cleaning either using multifloor vacuum or sweeping. He walks normal shortly after. I’m a watcher by the way. I love and enjoy watching people’s behaviors. The answers are there often times right in front of us. We just don’t look at the bigger picture. now a days he has the best coordination for jumping, agility and all the motor skills they grade in school , he surpasses.. But his feet are still very very stiff if I try to flex them up . Thank you for sharing Alison! It can also be a sign of spinal muscular atrophy. My cousin has it. Walking on toes is never something that should be disregarded.